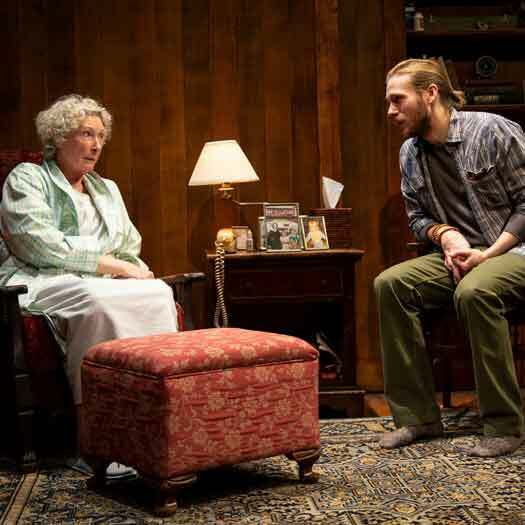 The world premiere of "Theo" at Two River Theater features Brenda Wehle, as Margaret, and Zachary Booth as Theo. Photo by T. Charles Erickson. There are times as a theatregoer when one sees a piece that, as it unfolds, enfolds you in its honesty and truth. Such plays are not common and therefore all the more appreciated. Two River Theatre is home to the world premiere of one such play, Martin Moran’s Theo. It is amazing and beautiful, touching and real. It is a work of genius and talent and great love, and it must be seen. Brenda Wehle (Margaret), Jon-Michael Reese (Abe) and Zachary Booth (Theo) in the world premiere of “Theo” at Two River Theater in Red Bank. Photo by T. Charles Erickson. Playwright Moran, collaborating with director Carolyn Cantor, has created the world of the Flynn family of the Catskill Mountain region of New York circa 2007. Matriarch Maggie’s (Brenda Wehle) health is failing. Daughter Elizabeth (Andrea Syglowski) is under the increasing stresses of dealing with Maggie’s care and her teenager Maddy (Jesse James Keitel) forging a sexual identity. Returning home after a 20 year absence is son Theodore (Zachary Booth), responding to a call for assistance from Elizabeth. 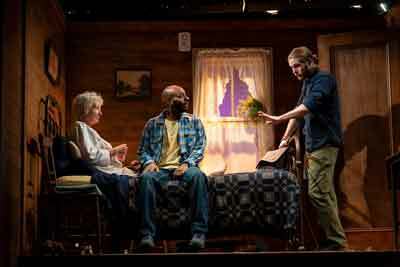 Abraham Cramer (Jon-Michael Reese), Maggie’s visiting nurse for hospice care and a former high school classmate of Theo’s, exerts a steadying presence within the family. As the five characters interact, old grudges are aired, quiet revelations arise, and unexpected grace emerges. Andrea Syglowski (Beth) and Jon-Michael Reese (Abe) in the world premiere of “Theo” at Two River Theater. Photo by T. Charles Erickson. Theo achieves all of this with fluid realism. There is no easy entrance into the history of this family, no shortcut to liking or understanding them. Yet as the play progresses one is rewarded with both understanding and compassion for these individuals who, despite all that has passed, retain deep bonds of love. 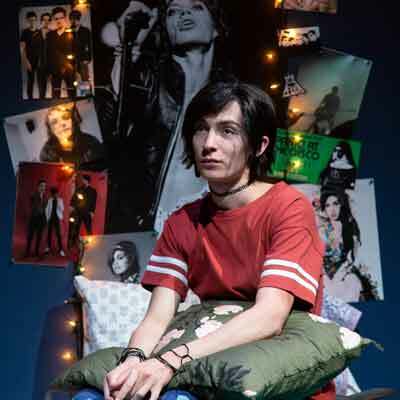 While there are many remarkable passages in this play, one of the most touchingly beautiful and joyous involves Theo telling Maddy the story of the teen’s birth. Jesse James Keitel (Maddy) in the world premiere of “Theo” at Red Bank’s Two River Theater. Photo by T. Charles Erickson. Of the five outstanding actors, two are worthy of particular praise. Brenda Wehle is one of those actresses that make you wonder why you’ve never heard of her before now. Her creation of Maggie, facing the inevitable decline that comes with age yet fighting back with all her strength, is a tour de force lesson in acting. Jesse James Keitel, a non-binary actor and performance artist, is remarkable in their subtlety. They capture with aching accuracy the mixture of uncertainty and determination that comes with adolescence and the claiming of one’s individual sexual persona. Keitel is an actor to watch for in their future work. Two River’s scenic design team set a high standard in their creation of the two-level farmhouse that is the Flynn home. 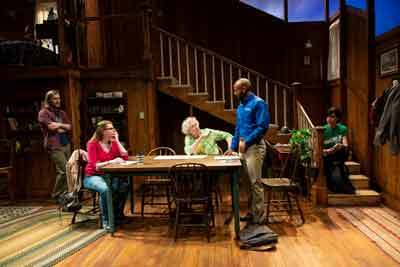 The work of scenic designer Antje Ellerman, lighting designer Yuki Nakase, and sound designer Leon Rothenberg has conjured a space that gives the sense of place rooting the family to this land. Scene from the world premiere of “Theo” at Two River Theatre. Two River Theatre is to be praised not only for commissioning this play but for giving Martin Moran the time and support necessary to come up with what is, to me, a modern American classic in Theo. This is a play of warmth and humor and surpassing beauty. I cannot more strongly recommend that you see this extraordinary production. Make the trip to Red Bank to spend time with the Flynn family and their long-lost son Theo. Theo is presented by Two River Theatre at the Marion Huber Theatre in Red Bank, NJ through March 24, 2019. For tickets and information, visit tworivertheater.org.